SUSAN LIVINGSTON married John Cleves Symmes in 1794. Susan was his third wife, the first two having died. Symmes had been a member of the Continental Congress, active in the military during the Revolution, an associate judge of the New Jersey supreme court, and in 1785 he was named judge for the newly designated Northwest Territory. In 1788, lured by the prospect of money to be made in land speculation there, Symmes and some associates contracted to buy a substantial amount of land in Ohio—known as the Symmes Purchase—to be paid for in part with notes issued by Congress to raise money to finance the Revolution. Symmes settled in North Bend, Ohio near Cincinnati and proceeded to subdivide and sell parcels of land. In 1794 he persuaded his wife Susan to come to Ohio, promising that she could return frequently to visit her family in New Jersey. Traveling with Symmes was his wife; a daughter by a previous marriage, nineteen-year-old Anne Tuthill Symmes called Nancy; and the daughter of Susan’s sister Kitty Livingston also named Susan (Kitty had married Matthew Ridley in 1787). Susan Livingston Symmes described the early part of the trip in a letter to her sister Sarah Livingston Jay who was in New York City. The letter is part of the Jay Papers at the Columbia Rare Book and Manuscript Library: Order no. 402136C. SARAH LIVINGSTON JAY, still in Paris with her husband John in July 1783, wrote again to MARY WHITE MORRIS. (See previous posts here, here, and here.) Sarah was pregnant and gave birth to Ann (Nancy) in August. (Daughter Maria had been born in Madrid in February of 1782; a son Peter Augustus had been entrusted to the care of his Livingston grandparents and aunts at Liberty Hall in Elizabethtown, New Jersey, when the Jays had departed for Spain in 1779.) The Preliminary Articles of Peace, which John Jay had helped negotiate, had been ratified by Congress in April, and the Definitive Treaty ending the Revolution would be signed in Paris in September. A busy time. Your very friendly letter my dr madam dated the 5th of Janry last, did not reach me until the 20th of May, & was the first I had the pleasure of receiving from you for the space of 12 or 15 months, therefore you’ll readily believe that nothing could be more acceptable to me. You do me justice my dear madam in believing that the sincere attachment I feel for mr. Morris & yourself is extended to yr. children; for permit me to assure you that nothing could afford either mr. Jay or myself greater pleasure than opportunities of serving them; indeed my chagrin at parting with them was heighten’d by the reflection that I shd now be depriv’d of the pleasure of evincing my friendship for their parents by attentions to them. Mr. Jay obtain’d a promise from Robt. to write him once a fortnight, but Tommy seem’d to think the request rather large as he had other correspondants, & therefore did not positively acquiese in the proposal, at least as to the frequency. Mr. Ridley has already recd. letters from them expressing their satisfaction with their situation, & I was not a little pleased to find that they still remembred us.—they are amiable sensible boys, & I think promise to repay the tenderness & liberality of their indulgent parents. . . .
Kitty [Sarah’s sister, Kitty Livingston] you say intends leaving you soon—how I pity her feelings on that occasion, for tho’ tis true that an affecte. mother & sister whom she loves attend to with impatience her return to them, yet, where so much gratitude & esteem is due, a sensible heart like hers must melt at separation—how delicately does my dr. mrs. morris insinuate herself into the hearts of her friends—she knows too well the friend she writes to doubt the pleasure she receives from her obliging expression of regret at parting with her sister. If yr sweet little Maria is grown out of my remembrance, how much must miss hetty be altered [Maria and Hetty were Morris children]—please to embrace them both for me & believe me to be most sincerely attached to you & yours. . . .
Mary Morris was undoubtedly grateful for Sarah’s news of her children who had been sent to Europe to be educated. Matthew Ridley was a family friend who would marry Sarah’s sister Kitty after his first wife’s death. Kitty spent a great deal of time with the Morrises in Philadelphia, leaving her mother in the care of her sister Susan in Elizabethtown, New Jersey. Sarah’s father William Livingston, governor of New Jersey, commander of the state militia, delegate to the various Congresses, and signer-to-be of the Constitution, was away a good deal. His home, Liberty Hall, was ransacked by both British and American troops who alternatively occupied it as battle lines shifted. The family sought refuge with friends or relatives. Robert Morris Collection, Henry E. Huntington Library. The illustration is of the final page of the Peace Treaty affixed with the seals of Benjamin Franklin, John Adams, John Jay, and the British negotiator David Hartley. A few days later, SARAH LIVINGSTON JAY wrote another letter to MARY WHITE MORRIS. (See previous posts here and here.) The topic is again fashion, a subject of great interest. It was common for women from America to ask their friends in Europe to keep them informed about the current styles, indeed not only to send them fabric and trimmings but also to have clothes made for them according to measurements provided. When sending packages, and even letters, it was usual to note the captain of the ship that carried them. Correspondence and shipments were geared to the departure dates of vessels bound for America. It was not without regret that I heard of Captn. Barney’s leaving Paris without having those things in charge, which you had requested might be sent by him; but I hope my dr. friend will acquit me of indolence when I assure her that I never recd. the commission with which I was honor’d till two days before the Captain’s departure, & one of those was Sunday, on which you know business could not be transacted: Mr. Le Couteulx still flatters me that the box may arrive at the port in time to be taken on board. The measure of yr. gown, cannot it seemd be found; but it is of less consequence as Mr. Ridley has sent out for Mrs. Powel two habits: a sultana & an English habit which you can see before you have yours made. The Pistache & rose colour were most fashionable last Autumn, but what will succeed them in the spring is difficult yet to divine; the trimming is made by the first miliner, & will either suit a sultana or habit, with both of which dresses they wear the petticoat of a different colour. You’ll pardon the liberty I’ve taken in adding an handkerchief: for as it was new, & consequently admir’d, I could not resist the inclination: its to be ty’d on before the gown, & then pinned down to the stays & when the gown is on to be put under the shoulder straps & then the tippet is put round the edge of it & renders a tucker unnecessary—I can’t imagine why it’s call’d a Chemise, for I cannot discover any resemblance that it bears to that part of dress.—The hat & Cloak are fashionable at all seasons of the year, tho’ in the Winter the Cloak is only worn in dress. Your stays, tho’ made according to yr. direction is perfectly the mode, stiff ones having long since been laid aside—but you forget that your waist has length as well as breadth, & therefore you’ll be obliging as to pardon yr. Taylor if he has not guessed right—am I at liberty to draw any inference from yr. partiality? 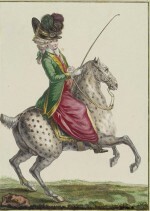 As black & white riding hats are equally worn, I’ve sent both, the one trimm’d in the present taste the other without ribbon that your own may be consulted—they are likewise very much worn of a morning with the hair dress’d without a cushion as for riding. English-born Matthew Ridley moved to Baltimore in 1770 and became the manager of the Maryland branch of a London mercantile firm. He became a supporter of the Revolution and went to Paris in 1781 as the agent for the state of Maryland with the intention of soliciting a loan for the state. While abroad he fulfilled requests for clothing from American friends. After the death of his first wife he married Sarah Livingston’s sister Catharine (Kitty). Elizabeth Willing Powel was the wife of Samuel Powel, the mayor of Philadelphia until the Revolution. Mrs. Powel maintained a French-style salon frequented by the political and social elite of the city. A sultana is the name (of exotic origin) given to causal but elegant at-home wear. A loose wrapping gown, it was worn without stays and therefore was comfortable. One could receive visitors in sultanas, and they were favored attire for portraits. A tucker is a detachable yoke made of lace or other fabric, to cover the breast when wearing a low-cut dress. A tippet is a small piece of fabric that goes around the neck and hangs down a little on either side, somewhat like a stole. The letter is from the Robert Morris Collection, Henry E. Huntington Library. For those interested in the fashion of the period, a very good source for the names of various kinds of clothing and the parts they consist of is the Glossary of 18th Century Costume Terminology.